No, but there should be. It's waaaaay better than mumble. And it's way better than the lobby for chat. Who cares? It's just a communication tool and a valuable one at that because it requires no setup, no desktop app and players all over the world are already using it en masse. It would be a good idea to use such a tool to strengthen this community. Look at all that it has done for evo in just like 2or 3 weeks. Those are amazing results. Just because something isn't open source doesn't mean that it shouldn't be used. It would be pretty silly to pretend that it didn't exist and pretend that players don't already like it just because it isn't open source. What is it, why should we use it and who's the intended audience? It is basically a community hub sort of thing. Chat, Voice channels, all hosted and free. You run your own server with it. The best part is that as a user, I can have a bunch of different servers up at once, and participate in all of them. That's why it's so popular, because it allows you to do everything that you normally have to use 3 different programs to do. Currently I'm in the evo one, but I get notified of anything happening in the other ones (granular notification settings ofc). I have friends lists that are synced with steam and skype and other apps as well. It's easier to answer what it doesn't do than what it does do. The only thing it doesn't do is screen sharing, but that's coming in future versions too. The thing is, players are already using it for other games and clans and communities, so essentially you are giving them the chance to participate in the spring community on the platform that they are already using that is already integrated with the services that they use. There are literally no downsides here. Hell, it doesn't even require you to use a client... you can just use the webapp (although I prefer using the client myself, because I don't like stuff like this living in a tab, that's annoying). Sorry, your question is so broad in scope that it's kind of impossible to answer coherently. The second question is easy enough... Who is the intended audience? Literally everyone. 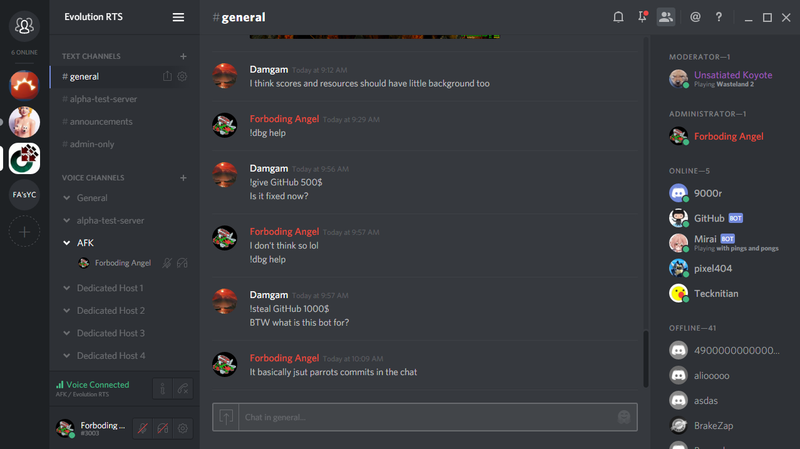 You could use it just for development chat if you wanted, hell you could set it up with bots to do all kinds of stuff. You can have gitter-like commit notifications, etc. The possibilities are reasonably endless. 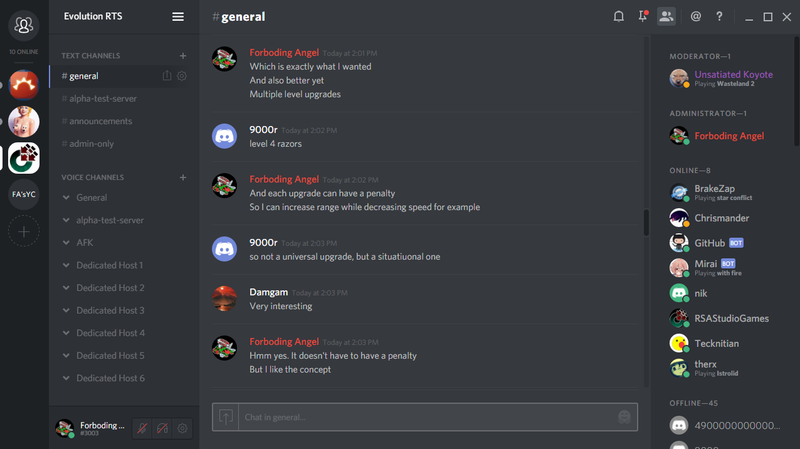 Edit: I would KILL to be able to launch spring server battlerooms from it. That would be stupidly cool. That's the main appeal I think. Evo seems to have picked up a few people solely by virtue of having discord. It's a far lower barrier than installing some weird lobby application that turns people off by being programmer-designed. But look at the online list... That's pretty cool. Was 13 people an hour ago and a lot of them were conversing with one another. Thanks to that get-together, they also kind of know each other a little bit too. But here is the important thing, for discord to be able to take off for spring, the head honchos like abma and gajop have to help push it along. Perhaps a newspost, a link in the top menu, !topic in #main and #newbies. That sort of thing. If the two of you don't want to participate in it, that is fine. I will keep an eye on it and keep things going smoothly, and I'm sure others will as well (ikinz for example). But you want a vibrant and thriving community in 2016? This is one of the easiest ways to accomplish that. You guys could even make bridge bots with discord so that #sy and etc chat can be relayed back and forth, making it an incredibly useful tool all-around.